← The Red Dragon’s Gold is Free! Cadmus Reid looked out from the bow of the tiny barge as it ferried his company across the Hart River. One hundred men were hidden behind crates, barrels, and bales of hay in hopes that any Loyalists patrols wouldn’t see them. The barge made regular runs across the river several times every day, carrying supplies between the two villages that sat on either side. Only a sliver of light reflected off of the calm waters, barely taking breaking the dark night. Oarsmen rowed to the steady boom of a massive drum, pushing the barge across to the eastern banks. They were further south of the village than they should have been, but Loyalist soldiers had been seen on the docks. Cadmus’ orders had seemed simple enough when Knight Commander Tollart had given them: survey the area on the other side of the Hart River, observe the enemy strength and return to the western side of the river. Engagement with Loyalist forces was at his discretion, but had been discouraged. His company would be cut off from reinforcements and retreating across the river aboard the barge would be difficult under fire. Cadmus caught his executive officer’s attention and waved him up to the bow. Gared Haden was one of four members of the company with any sort of organized military experience. Cadmus ran a hand through his auburn hair; he needed to get it trimmed soon. He hadn’t been to a barber since he had left Huntsville more than six months ago. The thought of home made Cadmus wince; his youngest child would be walking soon, his eldest was nearly ten. He would miss so much of their growth before he returned; if he returned. He had only accepted the commission as captain because of the pay. His two-year enlistment would earn him eight copper pennies per day and another five silver shields per month. His wife and three children would eat well on the monies that he would send back to Huntsville. He had promised her, in the letter that he had sent with his enlistment bonus of a gold crown, that he would refuse re-enlistment and return home after those two years were through. If the war went as many believed it would, this conflict would be over long before that and he would spend half of his enlistment commanding guards in some fortress. 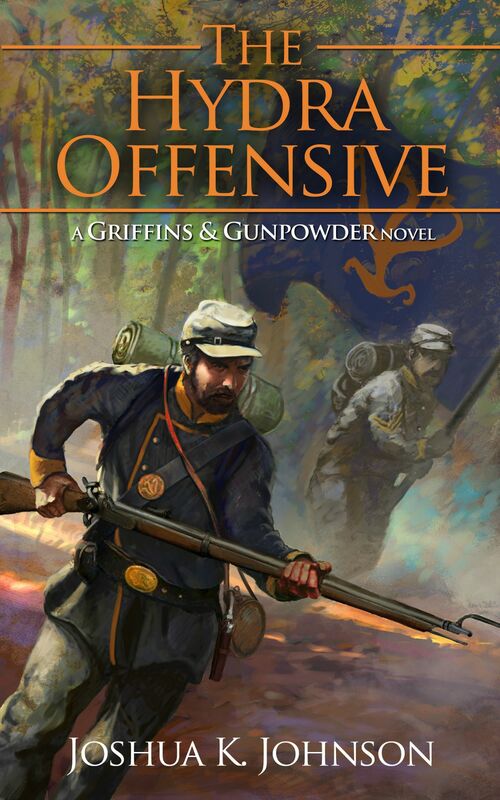 “Sir?” The lieutenant stood a hand taller than Cadmus’ own six feet; he hunched to hear the whispered voice of his commanding officer. The lieutenant snapped a quick salute and moved aft to pass orders to the platoon sergeants. It would be the non-commissioned officers that pushed the soldiers off of the barge; the officers were just there to make the big decisions. The drum beat faster. Boom-boom-boom. The oars splashed into the water faster, pushing the ship into the darkness. A crew member lit a torch, another lit an arrow from it, pulled back and let it loose. The fire arched and splashed into the water ahead of them. The archer lit another arrow, pulled back the string and let fly. The fiery projectile hissed through the air and then stuck into a tree. 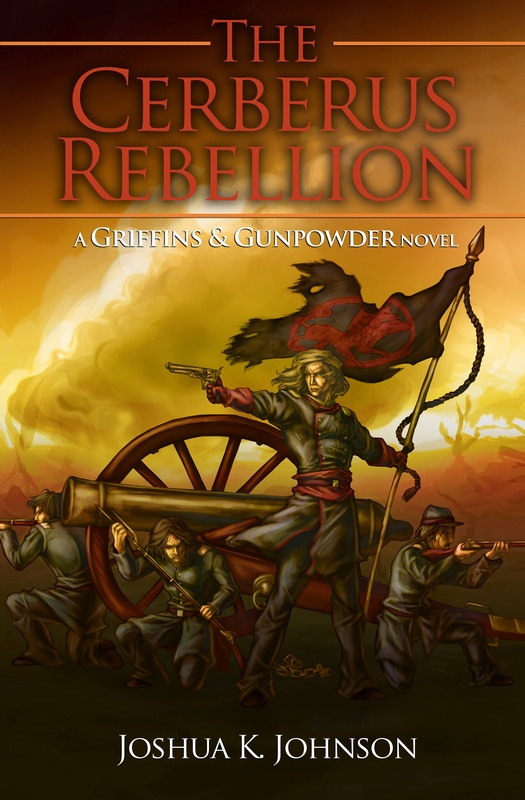 Posted on October 7, 2013, in Uncategorized and tagged fantasy, flintlock fantasy, griffins & gunpowder, Gunpowder Fantasy, muskets and magic, The Hydra Offensive. Bookmark the permalink. 3 Comments. I like it! I’d say its well done for a first draft, though is this a new character or a one off to show what is going on in this situation? The pacing is good, and it builds the suspense well. Though you may want to have something bit more of a detail along the lines of ‘interrupting the captain’s thoughts’ when the Lieutenant starts speaking, feels a bit too abrupt. As a general curiosity, what is the equivalent rank of Knight-Commander to a modern military? It’s obviously higher than captain, and I would hazard a guess that it is beneath colonel. Thanks for the feedback! Cadmus is indeed a new character. He’s going to be my “gritty details” POV to convey the close and nasty fighting. Knight-Commander is the equivalent of a Major in Ansgar. Kind of a half-rank between Major and Colonel. I’ll do a short post to explain how the knighthood works tonight or tomorrow. I’ve still got editing to do, obviously, so I’ll definitely look at the pacing and such. My pleasure! I look forward to seeing a ‘gritty detail’ character to match the political intrigue you set up in the last book! You’ve set up an interesting evolution of a medieval society into an industrial one, can’t wait to read more about it!